Combine first 5 ingredients in a shallow dish or zip-top freezer bag; add chicken. Cover or seal, and chill 2 hours. Remove chicken from marinade, discarding marinade. Grill chicken, covered with grill lid, over medium-high heat (350° to 400°) 4 minutes on each side or until done. Cut chicken into thin strips. Top 1 side of 6 tortillas evenly with Cilantro-Pecan Pesto, cheese, and chicken. Top with remaining tortillas. 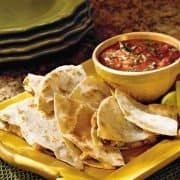 Cook quesadillas in a lightly greased skillet or griddle over medium-high heat (350°) 2 to 3 minutes on each side or until browned. Cut each quesadilla into quarters. Serve with desired toppings.